About the Authorbr> DILIP KUMAR ROY, who achieved fame throughout India and abroad as a singer, comes from one of the most aristocratic families of Bengal devoted to aesthetics. He was regarded as one of the foremost cultural leaders of the artistic renaissance in - India. He started his career as a singer and composer. Mahatma Gandhi once said of him: “I may make bold to claim that very few persons in India — or rather in the world — have a voice like his, so rich and sweet and intense.” But his great passion has always been his deep thirst for the spiritual life and he has written about a good many Yogis in his personal reminiscences. 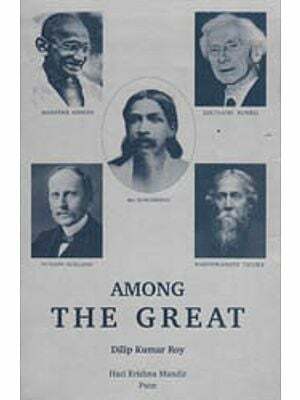 A friend of Mahatma Gandhi, Rabindranath Tagore, Romain Rolland and Bertrand Russell, and a disciple of Sri Aurobindo, he made his mark as a writer in English and Bengali. So far he has written about seventy books in Bengali and a dozen in English. Sri Dilip Kumar Roy passed away on January 6, 1980 at the age of 83. 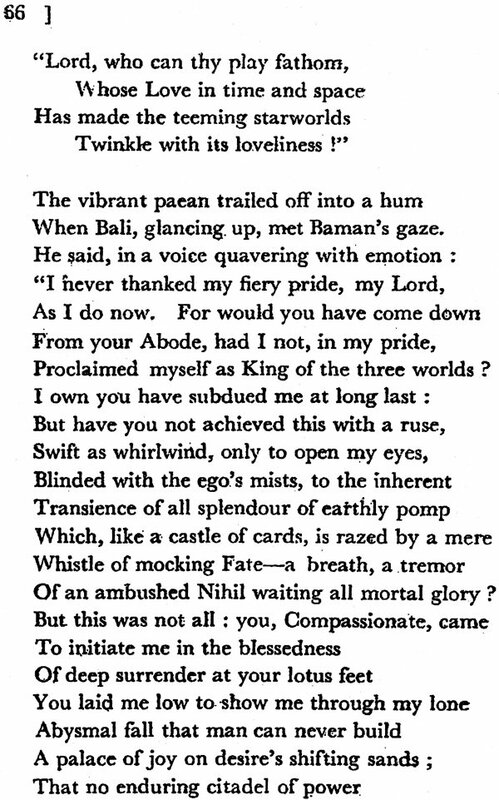 Of the three greatest classics in the sacred literature of India—the Ramayana, the Mahabharata, and the Bhagavata the last is probably the least well-known to English readers, so that the translation of a selection of tales from the Bhagavata rendered in free English verse by Dilip Kumar Roy must be heartily welcomed. Literal translations, however faithful, fail to bring out the beauties of the Sanskrit verse, while free translations are always open to individual interpretations. Mr. Roy frankly admits this and has not hesitated to allow his imagination rein in elaborating the terse and succinct Sanskrit text. 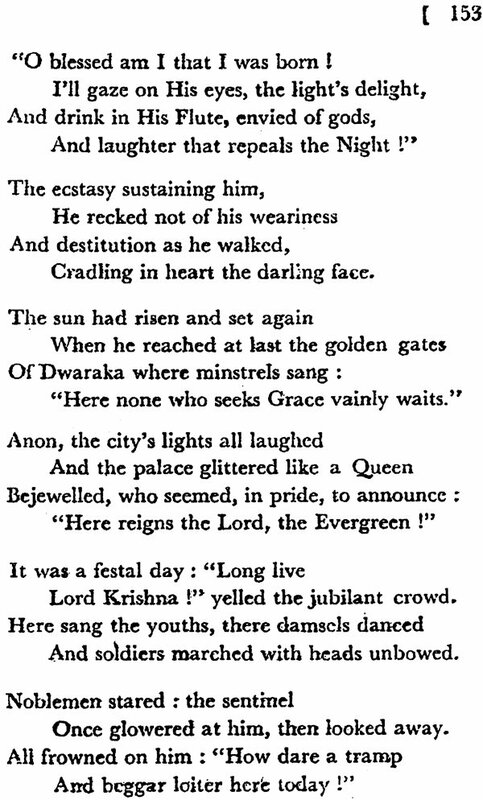 It must be granted that if anyone has the right to embark on this literary adventure it is certainly the author, for not only is he qualified to do so by his superb command of the English tongue but also by reason of the fact that he has dedicated his life to the service of Lord Krishna, with the transmission of whose message to humanity the Bhagavata is so Largely concerned. 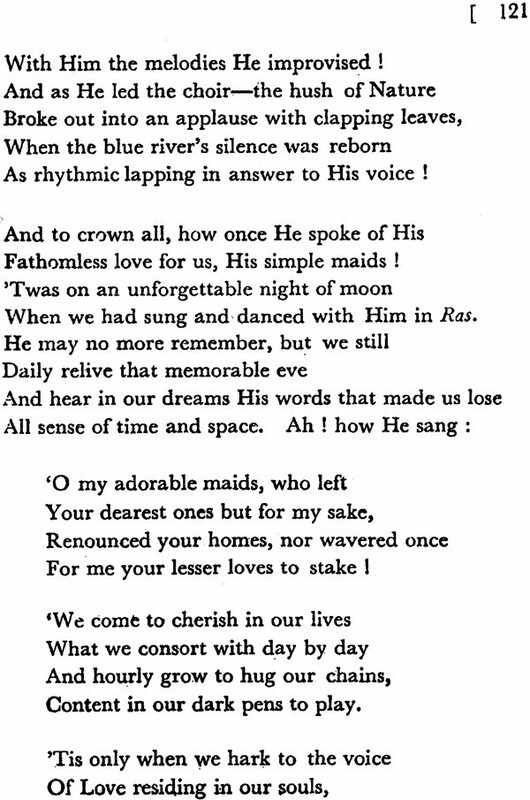 His magnificent flights of poetic fancy are resplendent with passionate love and devotion to the Lord. Indeed, if I may be permitted to state an impression gleaned from personal observation, I would say they are fraught with that same spirit of exaltation that inspires the author in the conduct of the musical kirtans which attract so many of the devout to his Ashram temple. Restraint in expression would be quite out of place in any interpretation of the great collection of poems gathered together in the Bhagavata. It’s stories teem with fantastic miracles and impossible happenings which are of course to be understood allegorically. Only the most arrant pedant will treat such extreme imaginings with disdain—the type of person for instance who might scorn to read the Pilgrim’s Progress, or for that matter Alice in Wonderland. 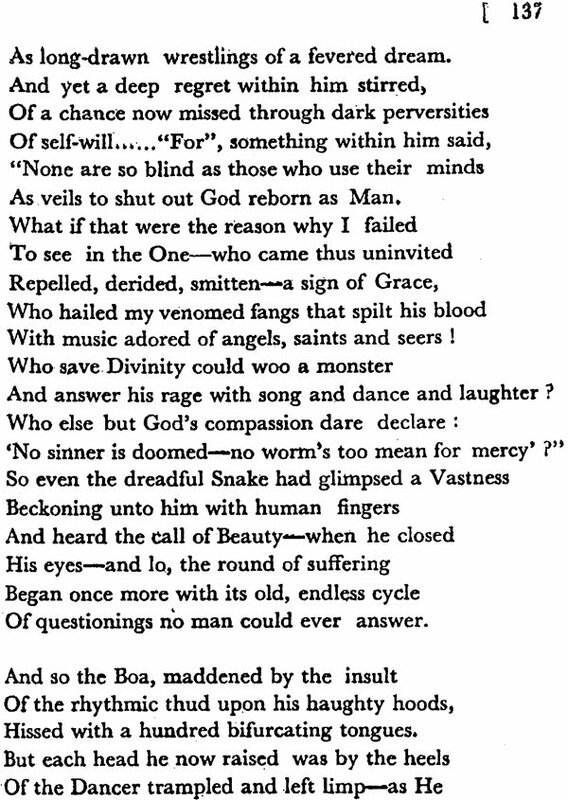 Rather than conform to wearisome logic and reason, the authors of the Bhagavata preferred unbridled poetic fantasy, exaggeration and hyperbole—a mode of expression, be it noted in passing, for which the founder of the Christian faith later also showed a marked preference, as witness- the assertion that it is easier for a camel to pass through the eye of a needle than for a rich man to enter into the kingdom of heaven. 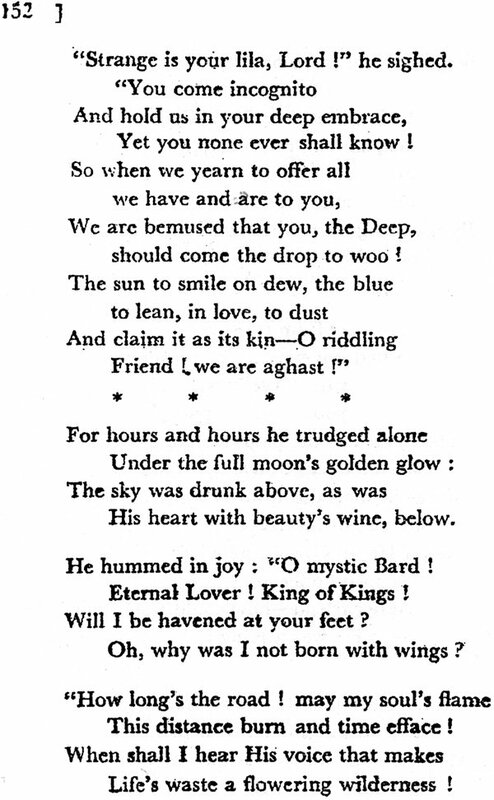 Aspirings borne to azure certitudes. This is the spirit in which to approach a study of he Bhagavata. It extols above all bhakti yoga, the yoga of love and devotion, but at the same time it warns against allowing the spirit’s bodily vehicle to become debauched. “Sons’” the Lord Rishabha proclaims in one of the stories, “this body deserves that divine discipline by which one’s mind becomes purified and through which is obtained the permanent bliss of the Atman.” Does this not herald St. Paul’s later message to the Romans: “I beseech you, brethren, by the mercies of God, to present your bodies a living sacrifice, holy and acceptable to God, which is your spiritual worship.” The student of the origins of Christian teaching will find much food for thought in the Indian classics. These ancient tales embody a message which is verily the essence of the Perennial Philosophy, and Western readers must gladly welcome this new and attractive version of the Hindu classic retold here by Dilip Kumar Roy with all the power and vigour of a rich poetic imagination. The moral of the parable is that scriptures like the Bhagavat are not revealed to its to be just discussed and commented on ad infinitum, but have to be imbibed with all our ardour and ache for the spiritual life. In other words, none can truly grasp the true message of a gospel like the Bhagavat’s so long as he is content with enjoying its poetic beauty and philosophic profundity: one has to grow into it till one is utterly transformed by its mystic call. (1) It brings vividly before our eyes the marvellous personality of Krishna in His many-sided vastness and universal appeal in a golden torrent of poetry, deep, withal, with a seer’s vision and a devotee’s fervour of rare inspiration nc1 grandeur. 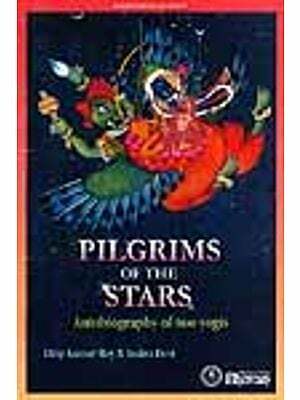 (2) It fills up a gap, left in the Mahabharata (as pointed out by Wand to Vyas in the Bhagavat) by delineating the flowering of Krishna’s life through dramatic vicissitudes an4 bringing out the wizard spell of His radiant beauty, magi flute, unpredictable movements and elusive personality. (3) Its stirring exhortations and marvellous hymn voiced through varied metres similes and metaphors flow on as it were with the ocean’s rumble, alternately intoxicating and overawing the senses. 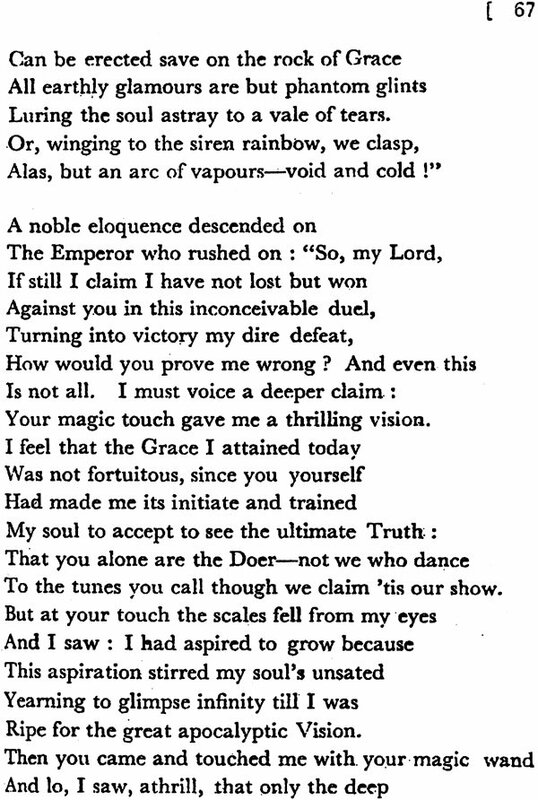 (4) And last, though not least, it is rife with the most rapturous descriptions, in incomparable poetry, of t e celestial-human function of the Avatar revealing the purpose of the Divine descent, and as such is of inestimable value to those who strive to understand the logic of the Infinite with that of the mind. All worship thee, in the end, O God of gods, Even those who love the other deitics, Unseeing that they and thou are one, pay homage, To thee alone—as all gods are thy forms. Manaso vapusho vacho vaibhavam tava gocharah. Give thyself, heart and soul, to me—the one Refuge of all who breathe: then thou shalt win Deliverance from all earthly fears and ails. 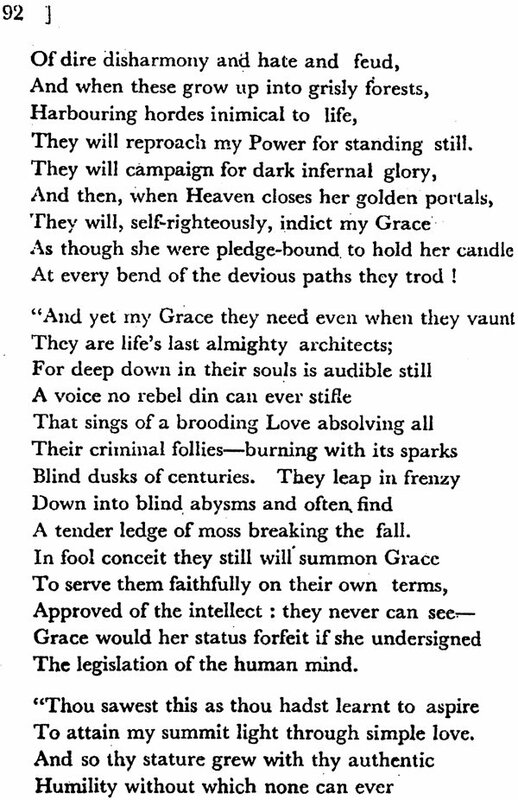 In other words, it is not through the little rushlights of the mind that His grace can be seen for what it is, because the Light wherewith we can truly see Divine Grace trans, forming our natures comes down only when we give ourselves to Him in Jove’s utter surrender. 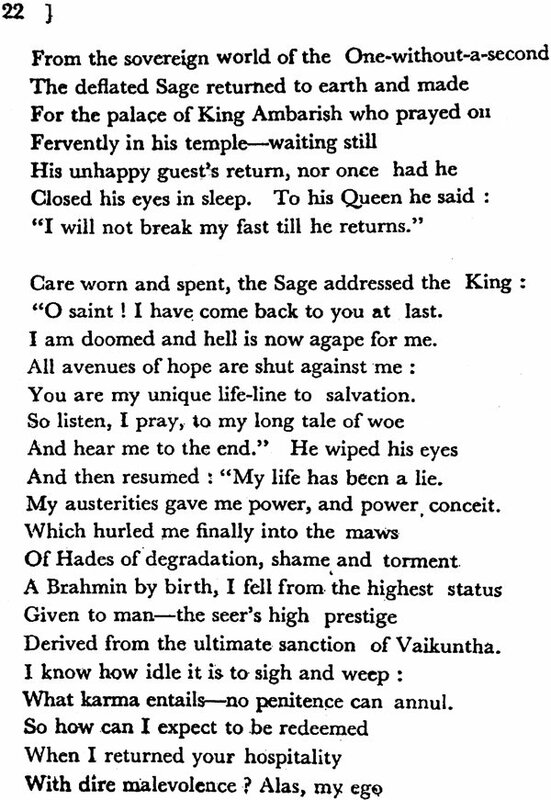 Also, this world— says the Bhagavat—through its thousand snares leads astray all but those who have learnt to love Him as “the dearest Friend and Lord of all, the Soul of all who breathe.” More explicitly, this world of pain and suffering must hold all in its grip of Maya till they grow to love Him with all they have and are, because love alone furnishes the due to the last deliverance for which all hearts ache, unknowingly to start with, and consciously, in the end. The Bhagavat does not, indeed, frown upon the Yoga of knowledge (indeed, in the Gita as well as in the Bhagavat, Krishna explains at great length how true knowledge is to be attained and why it is indispensable to all aspirants on their way to God-love) but it does emphasise through its profound disquisitions an beautiful tales, that when love informs and motivates our quest of the Eternal Reality behind the endless phantasmagoria of life on its lower planes, knowledge must Ito spontaneously from the higher to slay the darkness of cosmic ignorance. The twelve Books of the Bhagavat are replete with mystic discourses on the nature of spiritual knowledge and the conditions of its attainment. But its Leitmotif—dominant refrain—is Love,. the ultimate mediator between the aspiring heart and the answering Grace. Narayan comes, indeed L, every sincere seeker to guide, protect and deliver from the ills of life, but He serves those alone who yearn for Him with the homesickness of a helpless child. The way of Know ledge may lead the aspirant into devious paths and the delay his final attainment, but the way of Love leads the devotee straight to the Goal, endowing him at once with the deepest insight and highest strength. That is why the Bhagavat is at such pains describing how those who have love the Lord have swiftly outsoared the world’s vale of tears o the wings of Love and faith. The cosmos was created t manifest various powers of the Omnipotent Divine, but only to unbargaining Love is revealed the highest mystery—utta mam rahasyam—of the personal dependence of the Creator on His creatures, the answering yearning of the Deep for longing heart of the droplet. Seldom, indeed, has Grace Divine, made human, been limned with such consummate artistry and moving convincingness. 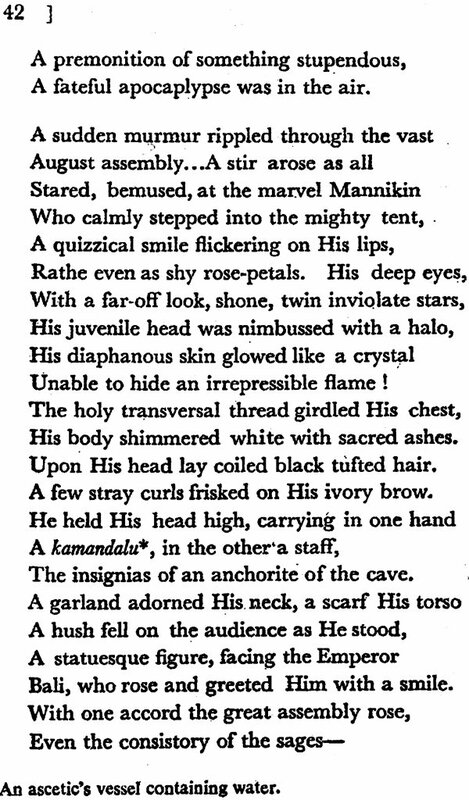 Not that the author of the Bhagavat is blind to the grandeur and majesty of the impersonal, transcendent and extra-cosmic Divine—the Akshara and Nirguna Brahma—but when all is said and, done, his heart is given irrevocably to the God-man who seeks birth oh earth, missioned to manifest a superhuman play whose exquisite beauty and ineffable bliss can only be experienced by those who call to Him in love to be answered back in love. The Divine manifests, indeed, Hs endless powers (bibhutis) through His endless lilts, but He opens His heart of love and compassion, the last, inviolate mystery, to none but His devotees who yearn to be utterly and irrevocably His. 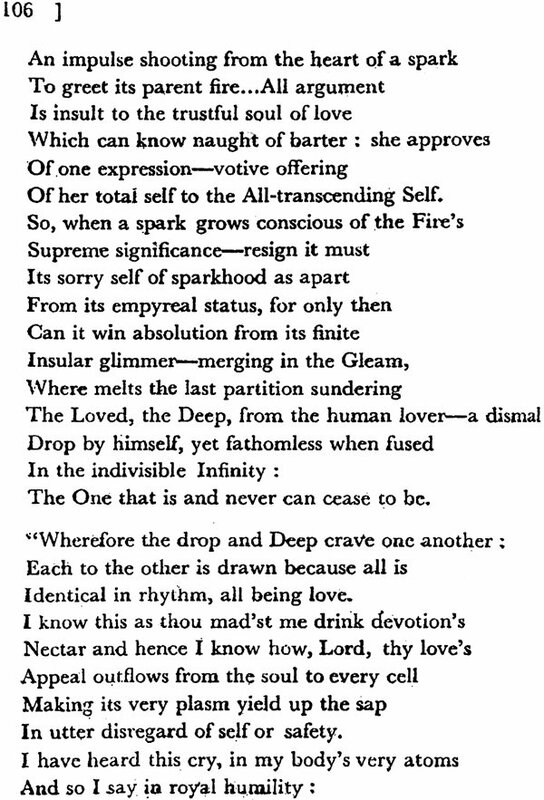 It is only when one has grown to accept this as the central message of the Bhagavat that one can truly claim to have “understood” it and therewith the import of its ecstatic stress on Naralila—to wit, the Divine incarnating Himself in a human body to manifest a new play of love and redemption. But for this, the Bhagavat has to be interpreted with the light of the soul’s spontaneous devotion—not the firefly flickers of the mind’s presumptuous logic or learned commentaries— bhaktya Bhgavatam grahyam na buddhya na cha tikaya. The reason is not far to seek. The Divine, as the Bhagavat proclaims time and time again, is beyond all conceptions of the mind. This is explained symbolically in Book IV, Canto 3: yat vishuddham sattvam vasudevashabditam tatra apavritah Bhagavan Visudeva, that is, the Supreme Lord, Vasudeva, reveals Himself to that heart alone which is purified of the ego’s blurs, such a heart being called Vasudev, the earth father of Vasudev. In other words, the highest Truth an Love that is Krishna only comes down to reside in those whose hearts are purged of the last traces of desire, but eludes those who set out to measure Him with the mind’ yardsticks. These may, indeed, speculate brilliantly about the nature of the ultimate Reality, but can never hope t perceive the Lord directly, far less live in union with Hi essential bliss and freedom. That is why the Bhagavat characterises the Avatar as myaya-manushya—One who is seemingly a man but essentially an incognito, being an Epiphany of the unfathomable Divine in a mortal frame. This, however, is difficult for the ratiocinating mind to conceive which, therefore, repudiates out of hand the unanimous testimony of the mystics down the ages that a finite human] when the Divine presides in him, can act from an infinite consciousness which utterly transcends his corporeal limitations. It will be going beyond the purview of this Preface to attempt a rational or theological vindication of the Bhagavat’s vision of the function of Avatar hood. I can only state briefly its formulation of the vision. achintyah khalu ye thvas tan na tarkena sadhayet: the truths that are beyond the intellect cannot be appraised or explained by mental logic. Then, appealing to our hum reason, Vyas says, in effect, that once we postulate the omnipotence of the Divine, we cannot rationally reject I inescapable corollary that He, being all-powerful, ca assume the human (or even a sub-human) form for Hi lila, world-play, if He so chooses. So, the Mahabharat rightly adds,, one’s repudiation of such a power of th Almighty is tantamount. to a final repudiation of His omnipotence: tadrishim cha vina shaktim na siddhet parameshata. The soul transcends its karma’s term less cycle of desires through the Yoga of devotion to me and wins to my last Self of Bliss. The six tales ‘presented here embody this dominant message of the Bhagavat, to wit, that one who has truly learnt to love Him in simple faith and surrender is taken straight to Him on the wings of His Light and Grace. To obviate a possible misunderstanding, I may add, in conclusion, that I have not attempted to translate the Bhagavat legends but followed freely my own inspiration while rendering them into English. But although I have always striven, be it understood, to stay faithful to the spirit and ambiance of the Bhagavat, I have not hesitated to take the liberty of elaborating here and there what the author of the Bhagavat has often left implicit or, at best, thrown out as luminous hints but not followed up as we, moderns, love to do. This, I have felt, will be rewarding because mythology is no myth but embodies, at its loftiest, the highest wisdom of the wisest hearts and the most Hari Krishna Mandir. Foreword: by Sir Paul Dukes, K.B.E.